summertime Archives - What the Forks for Dinner? We all have memories of favorite foods and summertime. 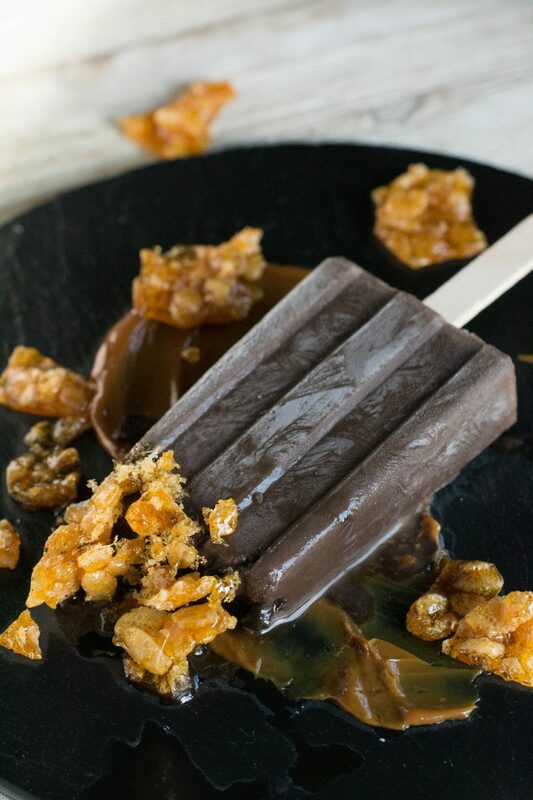 Fudgesicles are one of those memories for many of us. 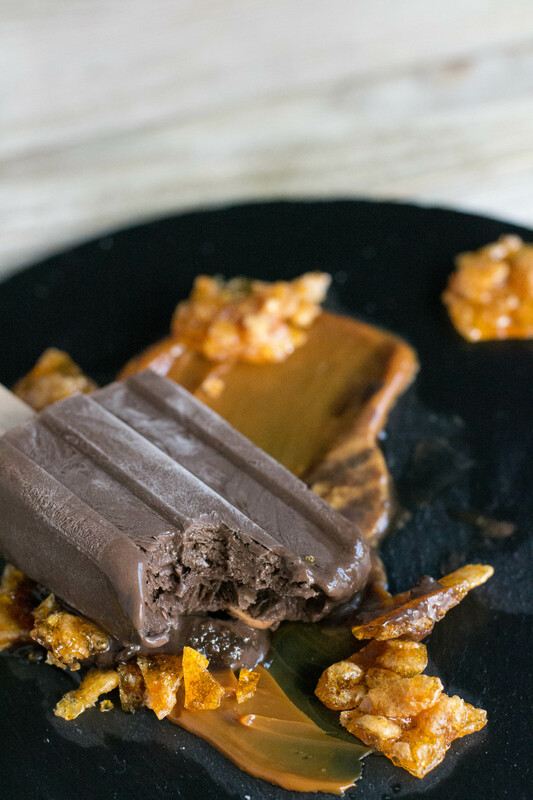 Caramel Fudgesicles are my take on a summertime classic. 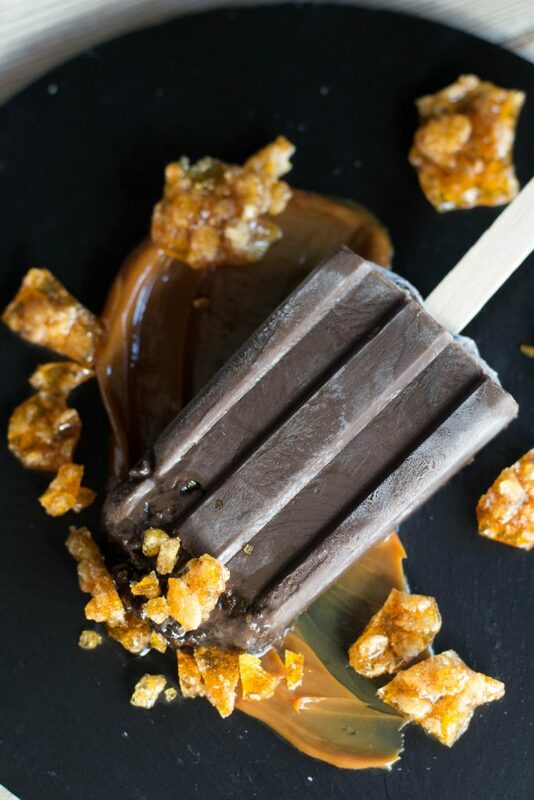 It was either popsicles or fudgesicles in the summer time. Hot and humid is the rule n the Midwest and after a day of riding bikes, swimming, and doing what kids do in the summer, nothing satisfies like a cold treat. 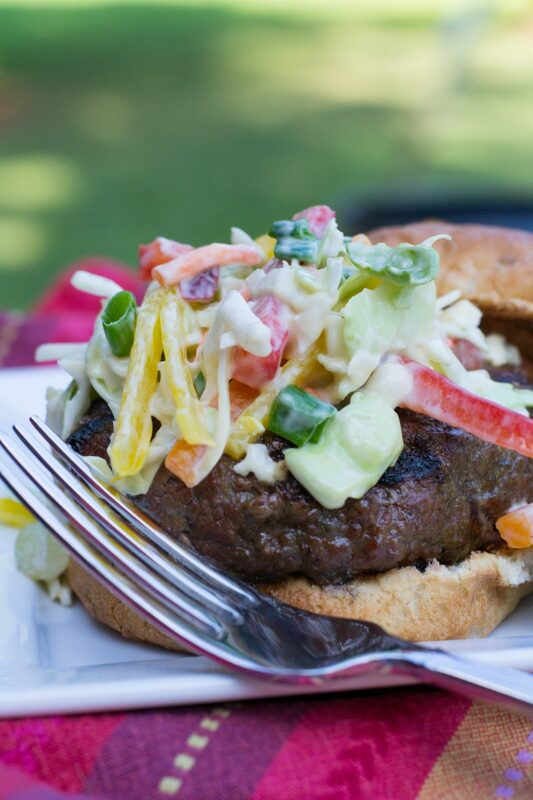 Burger are a summertime staple……… Jamaican Jerk Burgers are one of my favorite. I found this original recipe on one of my favorite recipe web sites Epicurious. When I first had access to the internet I stumbled across this web site and it has kinda become my foodie bible. If I am at a loss for inspiration, I can always find it here. I recommend this site for anyone who is out of ideas or needs a special recipe. Last year we traded our gas grill for a charcoal grill…….best idea ever!!! There is something that charcoaling gives, that you just can’t get from a gas grill. The age-old debate over which grilling method is “better” is always a HOT topic.. While no studies prove that either is healthier, gas does burn cleaner. Charcoal grills emit more carbon monoxide, particulate matter and soot into the atmosphere, contributing to increased pollution and higher concentrations of ground-level ozone. But, from a taste perspective, on the other hand, the smokier, richer taste of food cooked on a charcoal grill is preferred by many…….us!!!! 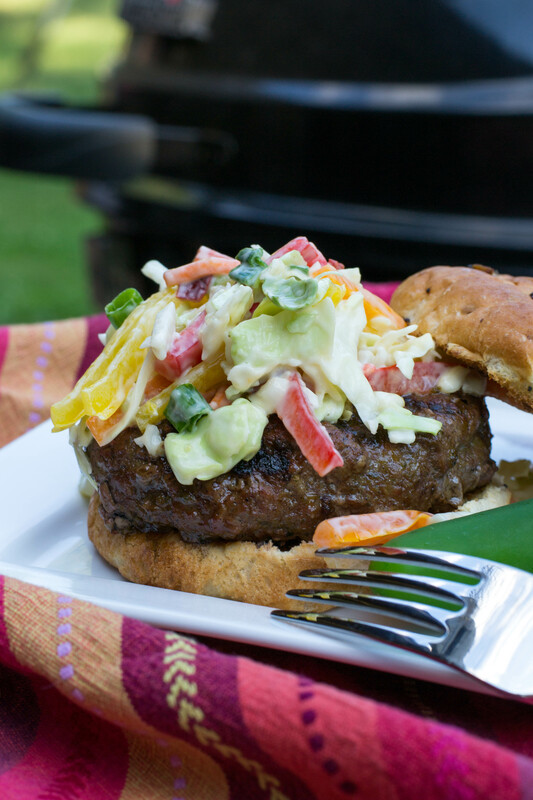 These burger not only get a smoky flavor from the charcoal, but also from the jerk sauce. Jerk is a style of cooking native to Jamaica in which meat is dry-rubbed or wet marinated with a very hot spice mixture called Jamaican jerk spice. Jerk seasoning is traditionally applied to pork and chicken. Modern recipes also apply jerk spice to ..well almost anything… Jerk seasoning principally relies upon two items: allspice (called “pimento” in Jamaica) and Scotch bonnet peppers. Other ingredients may include cloves, cinnamon, scallions, nutmeg, thyme, garlic, brown sugar, ginger, and salt. My recipe replaces the scotch bonnet with jalapeño, We like spice but not quite that much. Allspice, brown sugar, and scallions with soy make a marinade for the burgers. Reserved marinade makes a nice mop ( baste ) for the burgers as they cook….. keeps them super juicy. If you have something hot, you need something cool. 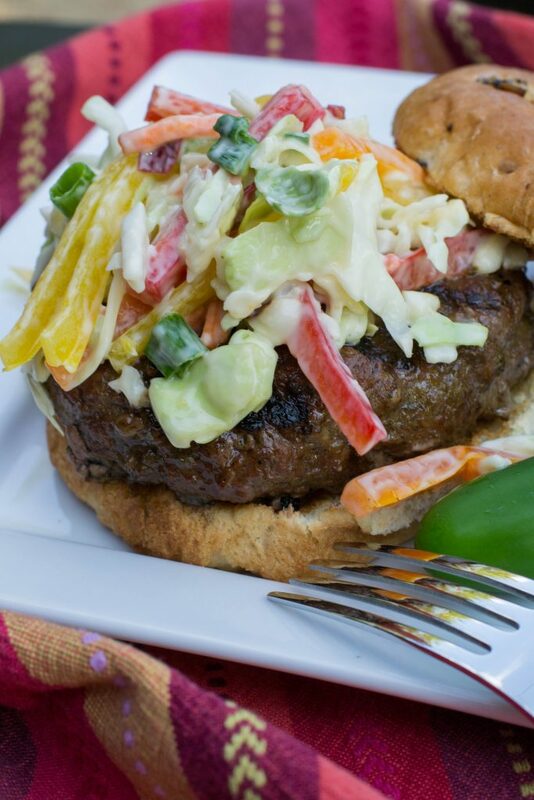 Jamaican Slaw is the perfect topper for Jamaican Jerk Burgers. Cool and creamy. Cabbage, multi colored peppers, and scallions are coated with a Miracle Whip…….I know I say this every time, but Miracle Whip is my preferred …….if you must, use mayo……orange juice, and for a little smokiness chipotle chilies……Chipotles are small jalapeños, that have been dried by a smoking process that gives them a dark color and a distinct smoky flavor. They are canned in a red sauce that has a fantastic, smoky flavor as well. Only three ingredients make the prefect sauce for the slaw. Toasted onion buns are the prefect vessel for the slaw topped burger. I toast mine in the toaster on the bagel setting…….only toasts one side…..great huh? 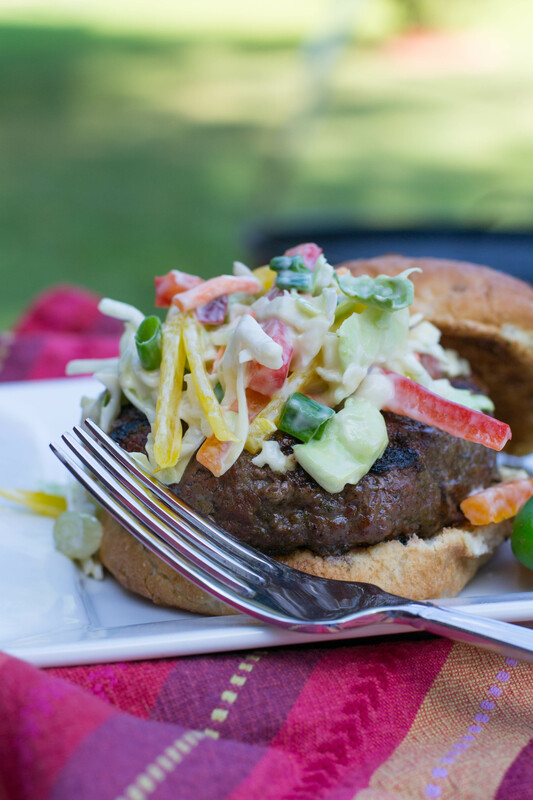 So, once cooked, place the burger on the bottom half of the bun, top with the creamy slaw, top with the top of the bun, and enjoy!!!! Next time you want a juicy, creamy spicy burger….fire up the charcoal grill and make Jamaican Jerk Burgers ! Prepare barbecue (medium-high heat). Set aside 3/4 cup jerk sauce. Shape ground beef into six patties and place in 13x9x2-inch glass baking dish. Pour 1/2 cup jerk sauce over patties and turn to coat; let stand 20 minutes. Grill to desired doneness, brushing occasionally with remaining jerk sauce, about 4 minutes per side for medium. Place burgers on bottom halves of toasted buns. 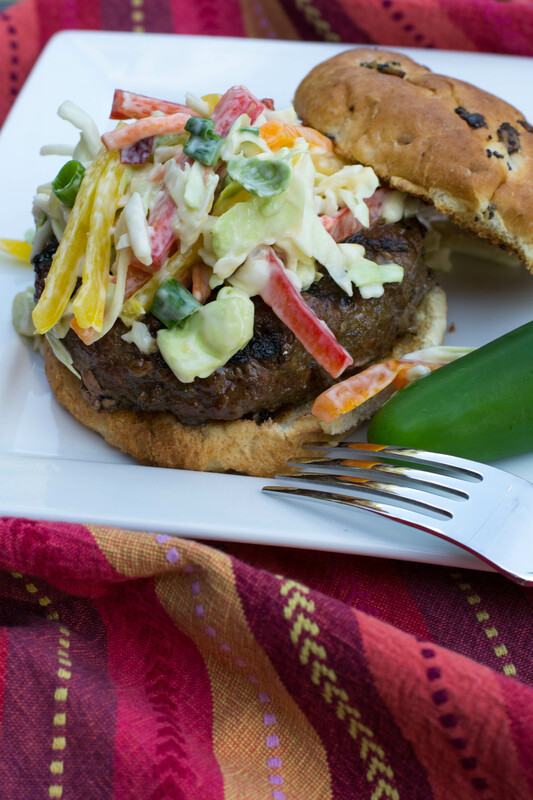 Top with Jamaican slaw and top bun.